There's been no shortage of deer puns of late; they've been coming at us like an aerosol dispensing antler spray. But Vijay Singh's admission to taking this bizarre product is no joke and presents serious implications for professional golf. Never mind mischievous speculation that he may have taken it on a stag do (and on they go) the game's credibility in dealing with doping issues is on the line. 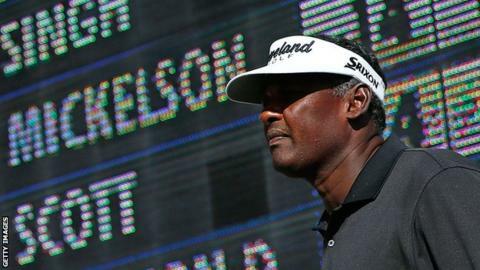 This three-times major champion, former world number one and inductee of the Hall of Fame has admitted taking a product that contains a banned substance and faces suspension from the game. Deer antler spray contains IGF-1, which is on the list of prohibited performance-enhancing drugs. Singh's claim that he wasn't aware of its presence is no defence although it can be considered in mitigation when punishments are being considered. Only one player has fallen foul of the doping policy that was brought into the game in 2008. American journeyman Doug Barron was banned for a year after testing positive for testosterone and beta blockers prescribed by his doctor. Singh's situation is aggravated by the fact that in 2011 the PGA Tour advised players to avoid using the spray, which seriously undermines his protestations of ignorance. He was taking it to promote muscle growth to assist his famed gym regime and according to the rules he was giving himself an unfair advantage. But it is not as straightforward as that. Singh has not failed a drugs test and, ordinarily, IGF-1 can only be detected from blood rather than urine samples. There is no blood testing in golf. There are those who believe golf is different from other sports. "It's not like cycling, it's not like football or like rugby," said Mark O'Meara. "In golf you have to be really calm, I just don't think it's that big of an issue in our sport." The 56-year-old American, although a contemporary of Singh's, comes from a different generation. In the current era sweet spots are fatter and the players are thinner. Golfers are also more powerful by design and that's why they spend so much time in the gym. "The athletes are just bigger and stronger," O'Meara admitted. "When I came out on the tour in 1981 Tom Weiskopf was a giant and he was one of very few who was six-one or six-two. "Now every athlete today that's playing this game is that size. You'll have the odd guy at five ten or eleven like a Luke Donald. "But to really dominate consistently this game requires power and a lot of that power has come about because guys are more physically fit. They're in the gym a lot more and they're bigger and stronger athletes." O'Meara still doesn't feel that this puts the doping issue more on golf's agenda, adding: "No, I don't. I'm a pro of 33 years and I just don't see that." Clearly, though, the modern player sees great benefit in improving levels of strength and flexibility in the gym. The doping programme is there to make sure they don't take short cuts and cheat their opponents. If anything, this case illustrates the need for golf to follow other sports and bring in blood testing. Without his unguarded admission to Sports Illustrated, Singh's use of a banned substance would have gone undetected. According to the original article that revealed Singh's use of the spray, he paid $9,000 for it last November. "I'm looking forward to some change in my body," he told the magazine. This year he has already had two top-thirty finishes on the PGA Tour. If, as it seems, he has achieved those results while breaking the doping code he has effectively cheated rivals playing by the rules out of prize money. There are also FedEx Cup and world ranking point implications. This is why the Tour is under pressure to be seen to take action. At least on performance-enhancing drugs they are required to publish details of offences and punishments. It doesn't apply to matters of recreational drugs and other disciplinary issues. Singh's high profile and standing in the game as a former world number one gives this case an added dimension, as does the fact that it is already in the public domain. The Fijian, who turns 50 later this month, still believes he is competitive on the main circuit but will also have the option of joining the lucrative seniors tour. He can certainly afford top legal advice and as a former Masters champion will surely be arguing a case to be able to make another appearance at Augusta in April. The Barron case provides the only precedent but whether the Tour and its commissioner Tim Finchem see fit to hand out a similar punishment remains to be seen. Finchem can't afford to be blind to the implications for the credibility of golf's anti-doping policy. How will he react? No idea. And although this is no joking matter, that's the punchline to another of those puns.